At KAR Auction Services, the widespread and varying investments it has made to adapt to the digital transformation in wholesale are multi-faceted. They have included the purchases of companies in the digital space (TradeRev), data and analytics (DRIVIN), international (CarsOnTheWeb) and mobility (STRATIM). And then integrating those systems. Through all of it, they’ve strived for “fast, fair and easy,” said KAR chief executive Jim Hallett. “Dealers want to do it faster. They want it to be easy — no brain damage. 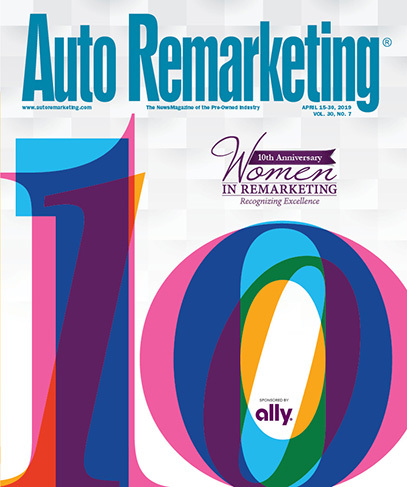 And they want it to be fair,” Hallett told Auto Remarketing at the recent NADA Show 2019 here. “They want to buy it in 45 minutes on TradeRev. They want us to take care of shipping, as quick as we can — within two days. They want to know if there’s a problem that we’re going to take care of it, (that) we’re going to take care of the arbitration. And they want to know that we’re going to be fair. “It’s what the world wants … you do that through technology, through data and analytics, through the things that we’ve invested in,” Hallett said. But it’s also important to note the major physical auto auction purchases KAR has made as recently as 2016, including Flint Auto Auction, Sanford Auto Dealers Exchange and the Brasher’s group of auctions.The company also opened ADESA Chicago in 2017. “Would we still buy a brick-and-mortar auction? I would say it’s not entirely out of the question. They have to be very selective and very strategic. But brick-and-mortar auctions do more than just buy and sell a car,” Hallett said. “They offer you the real estate, the marshaling, the logistics. As we think about the ancillary services, we’ll still need those. As we think about mobility now coming, we’re going to need real estate. “So, I don’t think brick-and-mortar auctions are done. The average age of a vehicle on the road is 11-and-a-half years old,” he said. “I think a young car, primarily off-lease cars — 2-, 3-, 4-, 5-year-old car — sells well online because you can get good condition reports and you can get good images. You start getting into a 9-, 10-, 11-year-old car, it gets harder to sell that car online. Likewise, Grace Huang, who is president of the Cox Automotive Inventory Solutions group that includes the Manheim auctions, said she sees a lot of opportunity for auto auctions when it comes to servicing new partners like mobility fleets. Similarly, a digital wholesale environment still has use for brick-and-mortar auction locations. In fact, it was a “huge January” for Manheim with cars coming into the auctions, Huang said. Last month, the Cox Automotive Mobility Group launched a new brand called Pivet that will provide a network of end-to-end mobility fleet services. That network will include both physical locations and mobile vehicle management solutions, and the initial flagship hub location is Manheim Metro Atlanta, which was previously an auto auction. The company said in a news release that Manheim Metro Atlanta now provides traditional fleet services to such clients as Lyft, Flex Fleet Rental, Hertz and Clutch. The fleet hub team there will also help develop advanced senor and electric vehicle technologies through innovation labs launching in 2019. The hub at Manheim Metro Atlanta will also provide a “consumer mobility lounge” where Lyft and Uber drivers can have their vehicles cleaned and serviced. There is also a partnership with Southern Company: Georgia Power, where they are working with Lyft and Electrify America in a project providing EV charging stations for ridesharing. In addition to more growth planned for the Manheim Metro Atlanta hub, the physical hub model is expected to launch at other Manheim locations and other properties this year. Huang also sees a future where auctions could run both daily sales and offer the services of what Manheim Metro Atlanta does, for example. It’s not “an either or” situation. Part I of the story can be found here.